If you love baking and you love making cakes, cake decoration might be a superb new career for you. Cake decorators can work for a variety of industries, from beginning in a small grocery store to becoming the lead decorator for wedding cakes and other specialty confections. Cake decoration has become exceedingly popular in recent years. Cake decorators need to be very precise and very motivated, and many of them take a lot of pride in their work. Cake designs can be as simple as piping on a sheet cake and as complex as 3D images made entirely out of cake. and many cake decorators can get their start straight out of high school by acquiring a position with their local bakery. A cake decorator often does not bake the cakes themselves, but instead is given cake to work with. Cake decorators will use frosting and other components to create a unique cake. Cake designs can be as simple as piping on a sheet cake and as complex as 3D images made entirely out of cake. A cake decorator may need to create internal structures out of wire to support a cake and they need to ensure that the cake is both beautiful and delicious. Cake is a unique type of art as it is consumed directly after being viewed. According to O*Net Online, the field is expected to remain relatively stable throughout the next decade. What Does a Cake Decorator Do? A cake decorator in a smaller shop will bake their cakes before decorating them. Other cake decorators will delegate the cake baking to others and will focus on the design. A very simple design may be done on a sheet cake with fondant or piping. A more complex design may require designs and structural integrity tests. The cake decorator might meet with the client to discuss the design of the cake or might instead get the design directions from a supervisor. Once the design is in place the cake decorator needs to be very conscientious and needs to move quickly. Various components will need to be either warmed or chilled as necessary for application. Once the cake is put together it needs to be stored properly until it will be consumed. Some cakes may include features that are not edible, and other cakes will need to be entirely edible. How Do You Become a Cake Decorator? Cake decorators can either acquire the position through experience or through education. There are many culinary arts institutions on a national level that offer degrees related to cake decoration. Cake decorators can also work their way through their field by beginning in smaller bakeries and apprenticing as is necessary. Cake decoration usually requires a moderate amount of on the job training, as the techniques involved can be quite precise and complex. How Do You Advance as a Cake Decorator? Advancement as a cake decorator often includes becoming a cake decorator for a larger or better cake company. 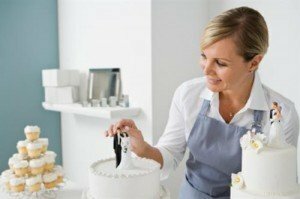 Cake decorators can open up their own catering companies or cake companies and become self-employed. The largest and most expensive cakes are usually made for weddings and related occasions. There are special companies that usually take these orders, and each cake made by these companies can run thousands of dollars. Cakes can sometimes be priced up to tens of thousands of dollars depending on the detail of the cake and the other requirements. Cake decorators can also move into the related field of cupcakes, which is an industry that has been very quickly growing. Gourmet cupcakes, as noted by the AIB International Cake Statistics, is an industry that has been quickly growing.